Alright, I admit, I'm currently writing about episodes I watched a month ago but didn't get a chance to blog about at the time because I was in the middle of finishing a novel. I'd put an emoji of some sort here but I don't think they really make one for, "sorry I let you down because I was writing something else like it owned me." Anyway, I do have notes for these episodes (of which there are four) but they aren't super helpful and that's not my fault. I'm in a clump of the series where Voyager was still finding itself, figuring out who it was and what it ought to be doing with its nine principle characters. One thing it did was try to give a little more depth to Chakotay's character outside of, "Hey I'm some sort of Indian, I guess, and I have a distracting face tattoo." This meant giving him a relationship. And, like most Star Trek relationships, this one was doomed to fail and fail hard. Maneuvers is pretty much all about how Chakotay and Seska used to get it on but then she turned out to be a Cardassian and now she's run off to hang out with the most ridiculous aliens in the Delta Quadrant so that she can improbably eventually take over Voyager. I don't hate the Chakotay/Seska thing. I think it actually kind of makes sense--more sense than Chakotay and Seven, especially. She's intense and rebellious and the member of a victimized society which Chakotay is clearly into. Chakotay has a face tattoo and a startling ability to break into the tough guy leader mode. They're both impetuous people who probably like to drip candle wax onto each other and then talk about their feelings. So, yeah, I get it, I guess. 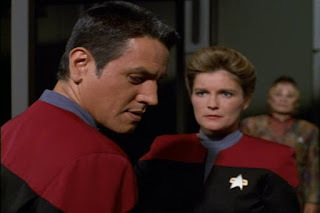 Anyway, in Maneuvers, Chakotay and Seska haven't been a thing for a while but Seska (now looking way more Cardassian) feels like coming around to twist the knife and make him a little miserable. She succeeds at this and Chakotay ends up disobeying Janeway's orders and goes after his ex-girlfriend and her idiot Kazon friends. Everything eventually works out alright but Janeway is super disappointed with Chakotay in the end. My issue with Maneuvers and, really, Seska in general is that she seems like a bit of a missed opportunity. She could've been Voyager's Gul Dukat--a merciless, intelligent, dangerous enemy whose cunning and cold nature make a deliciously love-to-hate character. Instead she takes up with some of the most absurd aliens in Trek--people someone with her apparent standards and temperament would never associate with--and then she's surprised when she (a woman in a backwards, misogynistic society) can't get ahead. Come on, Seska, you could've aligned yourself with the creepy female caretaker. Eventually she does manage to do some real damage and I'm excited to get to that episode. Now that I'm no longer writing this novel night and day (again, if there were an emoji...) I should be back on track!